Barsaat was the first hit film of the now legendary R.K. Studios. Set up by Raj Kapoor, the studio produced some of the most important films of the 1950s. 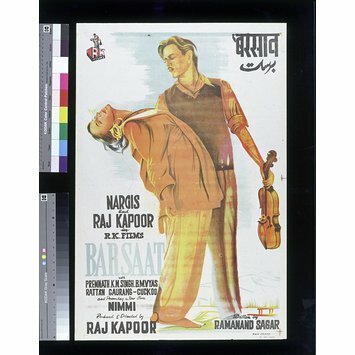 The poster depicts Kapoor, a musician, holding a violin in one hand and a swooning girl, Nargis, in the other. A stylised form of this image became the studio's logo, seen here in the top left-hand corner. It represented the great love between the two and was a symbol of the studio's first success. 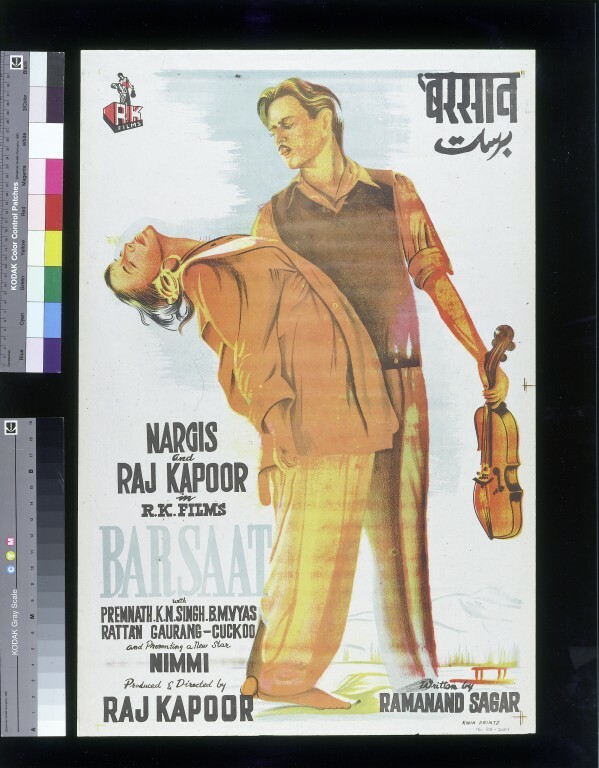 It was incorporated into later reprints of the Barsaat poster. The poster depicts the actor, Raj Kapoor, a musician, holding a violin in one hand and a swooning girl, Nargis, in the other. This film was the first success of R.K Studios and symbolised the on and off-screen love affair between the two stars. Due to the success of the film a stylised form of this image became the studio's logo, seen here in the top left-hand corner (thus indicating that this is a reprint of the original poster design with the logo added later). The English title is in the bottom left hand corner and the Hindi and Urdu titles are in the top right hand corner. Rachel Dwyer & Divia Patel, Cinema India: The Visual Culture of the Hindi Film, Reaktion Press, 2002.